Japan horse racing does double the handle of North American racing, despite only having 40% the population of the USA. It is hard to peg the disparity on one thing, but it is most likely a combination of culture and gambling competition. Legal casinos do not exist in Japan, though there is a common slot like game called Pachinko that is offered throughout the country. Soccer betting just became legal a few years ago, and since then betting on the other three legal "sports" have taken a hit. The other three "sports" are motorcycle racing, horse racing, and ummmm power boat racing. Power boat racing aka Kyōtei has to be the most boring betting game I've ever seen. I couldn't find an exciting race despite looking at close to 10 Youtube videos this morning. It boggles the mind that they still do $9 billion in handle (which is way off the high) per year. First, the takeout is 25%, and second, the field size is limited to 6 starters. It absolutely flies in the face of know-it-alls like myself who believe that in order for horse racing handle to grow significantly, you need a much lower takeout and larger field size. handicappers, at a ridiculously high 21% average takeout. To attract a significant amount new players, to a game with a high learning curve, there needs to be the idea that the game is beatable by at least a few. Back to power boat bettors. Another factor may come into play when a gambler is at the power boat course: I believe they can only bet on the 11 or 12 races carded there. Fewer gamblers go home completely broke, like they are more compelled to do when at a track or simulcast center faced with 3 tracks going off every 10 minutes. 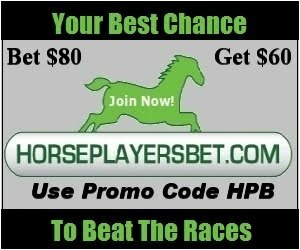 There are ways to cut down the takeout as well to an amount that most horseplayers can't achieve, and that is simply to play the 1 and 2 posts to win. The ROI is close to .94 for that type of wager. Of course, that means that some plays are unbelievably taxing on a bankroll. The boat jockeys are responsible for their own boats, and when propellers are changed, the public is supposed to find out. It is hard to think that cheating doesn't occur. It is so easy not to make the front, and front runners win almost every time. One good thing, there are non fair start refunds, which should be the case in harness racing. If a boat is either 1 second fast or slow at the start, all wagers on that boat are refunded. I just find astounding that horse racing in North America is doing so relatively poorly. Handle on the boring sport of power boat racing in Japan is doing just as "well" as the entire Sport of Kings in North America. And things are looking to be worse with sports betting on the near horizon and with states imposing more and more restrictions on the Horseplayers who are left betting horses. And then you have racing leaders like Frank Stronach who seems to believe that blowing dough on a statue of Pegasus is far more important than reducing track takeout for the horse racing customer.